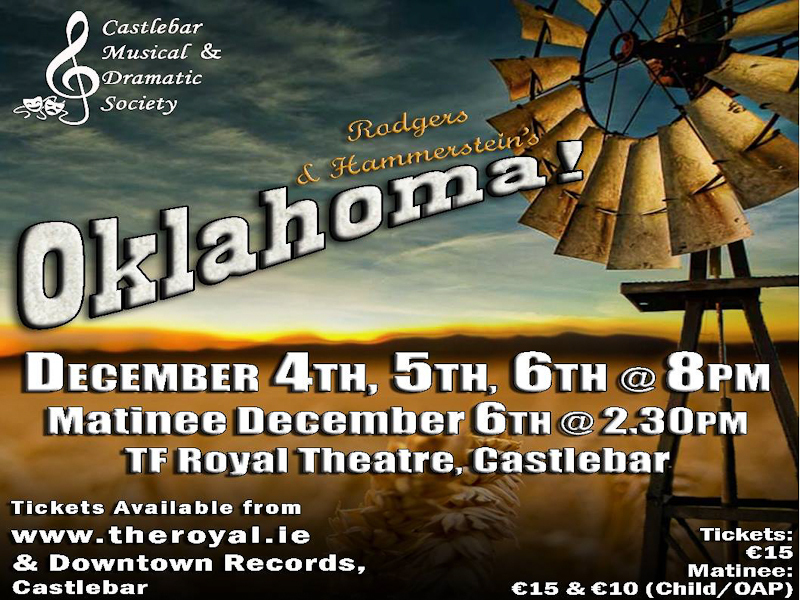 Chicks and ducks and geese better scurry - the recently formed Castlebar Musical and Dramatic Society are climbing clear up to the sky with their first big production: Oklahoma, the ever-popular Rogers and Hammerstein musical. Get your tickets for one of the four performances at the Royal Theatre on 4th, 5th and 6th of December - matinee on 6th Dec. 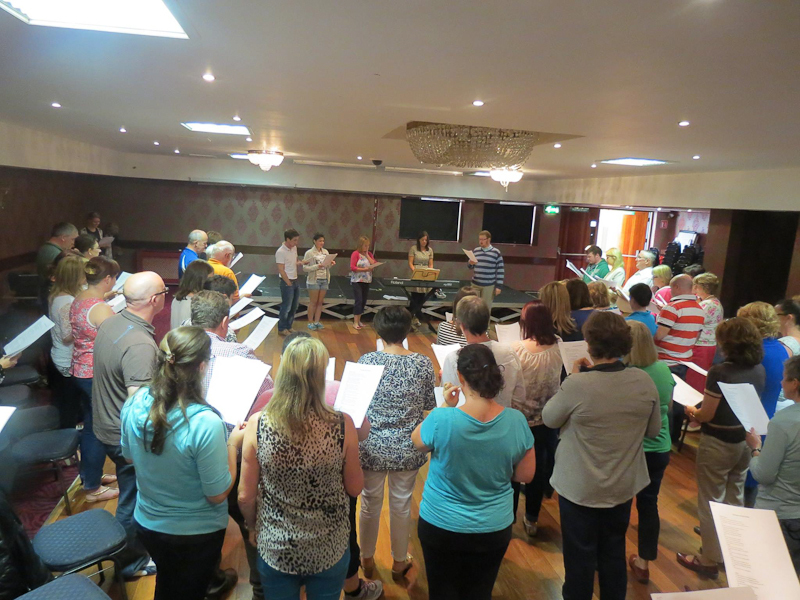 In Rehearsal - photo from CMDS Facebook pages. The classic love story of Curly, a handsome cowboy, and Laurey, a headstrong young woman, is played out against the backdrop of the western territories of the USA at the turn of the 20th century. This light-hearted funny story of the bumpy road to true love will be sure to delight people of all ages. With an extremely talented cast of over 60 performers, audiences will be treated to a terrific performance and a wonderful night's entertainment. 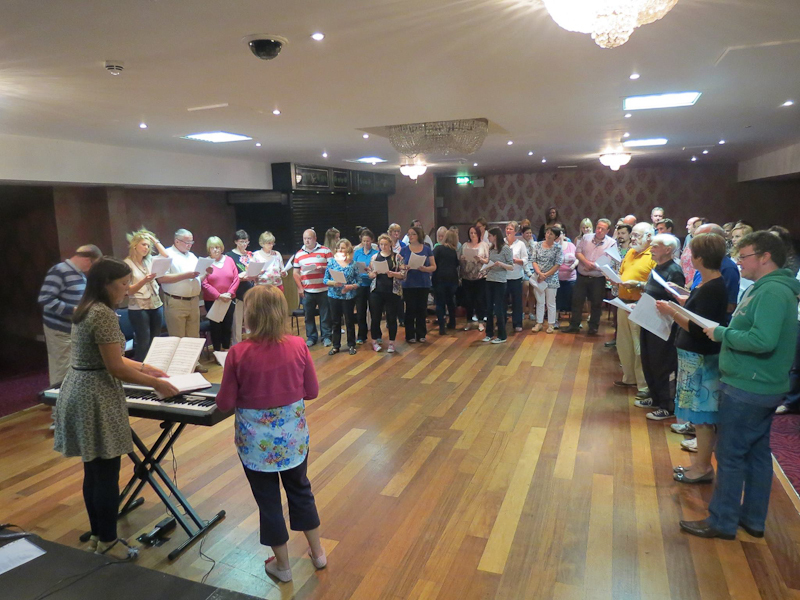 Patron's tickets are available directly from Castlebar Musical and Dramatic Society committee on 087-7612214. For €50, patrons will be entitled to two tickets, a show programme, attendance at the mulled wine reception on the 4th December and their name published in the programme. For other tickets book at the Royal Theatre or Downtown Records. The cast in rehearsal - photo from CMDS Facebook pages. Aunt Eller: She acts as the town's aunt, a fun-loving caretaker. She watches over the town and a ranch with her neice, Laurey and a hired hand, Jud. She sees the good in everyone. Andrew Carnes: He is very protective of his daughter, Ado Annie. 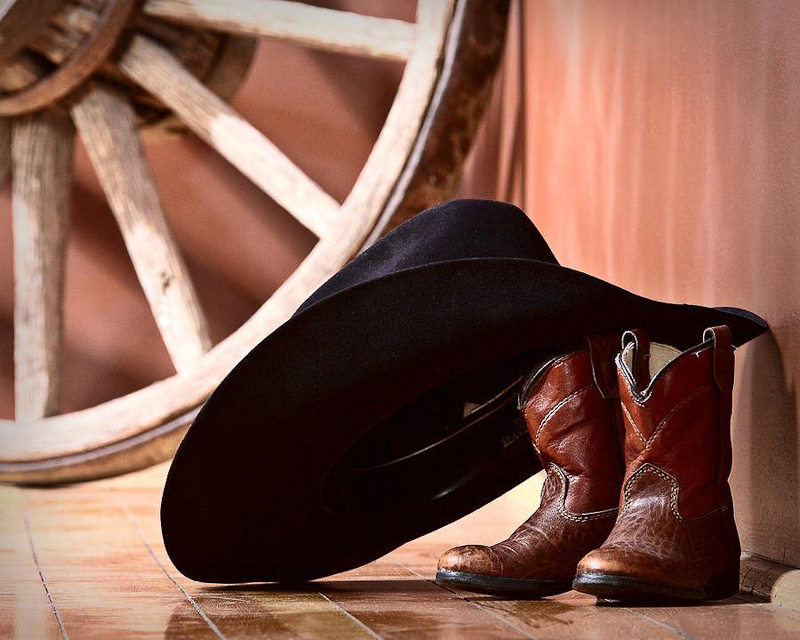 He doesn't want Will Parker to marry her because he believes the cowboy's life to be risky and unreliable. To prove this isn't true he asks for Will to maintain $50 in order to have his daughter's hand in marriage. He is a rancher, and doesn't feel very kind to cowboys in general. Curly, M, Baritone: Has a confident swagger and deserves it, he is the most handsome man in the whole county. He is in love with Laurey, but refuses to admit it. 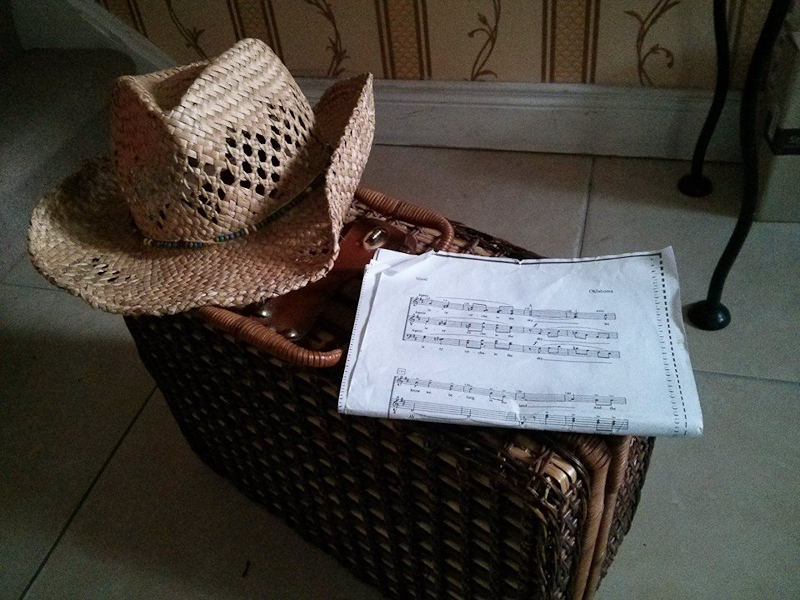 He's a cowboy and the romantic lead. He is called Curly for his curly hair. Laurey: She has an innocence and yet an air of knowledge about her. She lives with her Aunt Eller on a ranch and is in love with Curly, though she may not admit it. Dance Curly: may be doubled as another character or in the ensemble. He must be able to dance a ballet and should resemble Curly in Laurey's dream ballet. Will Parker: Will is a cowboy who is skilled enough to compete in rodeos. Being able to do rope tricks is a plus. Will is a dance role, tap dancer preferred. He is interested in Ado Annie, but isn't the brightest bulb. Jud Fry: described as dark and growly by others, Jud takes care of the ranch Laurey and Aunt Eller live on. Jud does not fit in with the society he lives with, he is seen by most as an outsider and misunderstood. He has feelings for Laurey. He works hard to take care of Laurey and Aunt Eller on the ranch. Ado Annie Carnes: Andrew Carnes' daughter, she "Can't Say No" to anyone. She wants everyone to be happy. Her heart is always in the right place, but she isn't always the best judge of character. A comic, romantic lead, she is wooed by Ali Hakim, but deep down she feels a connection to Will parker. Ali Hakim: traveling peddler who says he's from Persia (present day Iran). Though we aren't sure how much of what he says we can believe. He, like Jud, is an outsider to this community but not feared by most. He likes pretty things and women. He pursues Ado Annie and Gertie Cummings. Gertie Cummings: From the next town over, she has eyes on Curly and isn't waiting around for Laurey to say no to him. She has a unique laugh.